Triodos have an extensive ethical investment policy that goes beyond ‘negative’ screening, only investing in businesses and charities that it judges to be of social or ecological benefit. They commits to values of sustainability, transparency, excellence and entrepreneurship. Triodos operate with transparency; they publish the details of every organisation that they finance. On the Triodos Bank website you can find detailed information on the projects that Triodos (and by extension their customers) support. 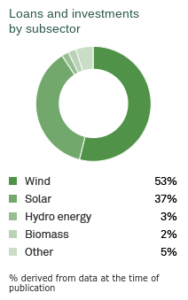 According to their 2017 Integrated Annual Report, 23.6% of their investments are in the renewable energy sector, which is broken down further on the right. Due to the lack of UK branches, you can’t currently pay cash into your account, only cheques. Their accounts are designed to be online (via mobile app and internet banking). Triodos offer a current account at a fee of £3 a month. With this current account you will also receive an eco-friendly contactless Debit Mastercard made from 100% renewable resources. On the account there is no unplanned overdraft. You can apply for the account online. 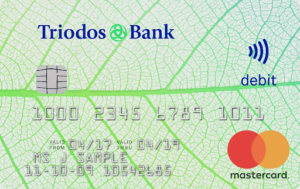 In addition to current accounts, Triodos offer a variety of savings account which vary in interest rate; limits on withdrawals; and notice periods. Any money that you hold in a Triodos current or savings account is covered by the Dutch Deposit Guarantee Scheme. You can switch to Triodos easily using the ‘Current Account Switch Service’ - they explain how here.